Most of you know that I had to have my beloved cat, Bijou, euthanized on the 9th...I have been in so much pain that I cannot describe it. I am sure it is a combination of grief and guilt...I feel guilty because I could not help her. I did not have the money to have extensive testing done so we will never know what was wrong...I carried her to the litter box several times a day, padded my bed in case she had an accident during the night, I even had a small litter box on the bed the last few days. I was so proud of her for using it the morning of the 9th. I did not realize until later that she was also using throw rugs and clothing that was on the floor. When I found out, I had so many loads of laundry to do and the SMELL was absolutely overwhelming. I made the appointment feeling like I was punishing this poor little thing for something she could not control. She could no longer stand up, her front legs and back legs were so weak and wobbly. She used the throw rugs to pull herself around when she was on the floor...I had a pile of clothes waiting to go to Goodwill and she apparently pulled herself to them and lost bladder control. The vet said she was probably so uncomfortable being held upright to pee that she never emptied and she likely had an infection, hence the strong smell. The vet told me over and over again how lucky she was to have me and that we had done much more than most people would have. She knew how much I loved that cat, she was like a baby and I felt like it was my responsibility to care for her so losing her was simply crushing. I still cry when I think of her, I cry when I look at the place where she slept...I cry a LOT. I haven't been here much because it's not your responsibility to get me through this, it is MINE. I don't want to make people feel uncomfortable because I cannot stop crying, I know from past experience that I will get stronger. In the meantime, I cannot be here as much as I used to even though I do get great comfort from each and every one of you. I thank you, with all of my heart for the prayers and the love and the messages. We heard from the hospital an hour ago...Mike has to be there at 8:00 for surgery. We will have to leave home no later than 6:30 (I work the day before so I am usually half dead on Monday). I don't know how long the surgery will take, we will stay in Charlottesville at the Hospitality House overnight. It will cost $20 for the two of us, we will have a room and a shared kitchen. He has to keep his head down for the first two weeks...maybe longer. Looking down like he is reading a book. He can only raise his head to eat and to swallow pills and liquids. I may try to take my tablet with me but I have no idea if I will be able to connect to wifi. I couldn't connect at the hospital when he had the heart attack...this is a different hospital. I am going to finish getting my house ready for us to be gone, our son is going to spend the night to feed the cats...we have a feral cat who is on the front porch and who HATES him and our other indoor cat who is in serious mourning. I don't want them alone overnight if it can be avoided. Dear you have nothing to be guilty about. You gave Bijou a wonderful home and life. I believe that she was a rescue - so you gave her so much more than if she would have had to live to rest of her life in a shelter. May she RIP. It is good to hear that the surgery is scheduled and that your son will help with your pets. Hopefully you can connect to the hospital WIFI and pass some time with us here at EX. We miss you! Take care of yourself! Will keep you and your family in my prayers. Ellen - you did everything you could for Bijou! No doubt about that...it really was time. But - I know that it still hurts and we still second guess ourselves..... Keep putting one foot in front of the other and things will get better. You will never forget her....she will always be in your heart. I wish all the best for Mike. Prayers for you both! Sweet friend you know how much you are loved by us all, surely you do. As Jennifer said you did everything in your power to help her and with a heart like yours...I know it to be true. Im relieved to hear Mikes surgery is finally coming up and we will ALL be praying for him and for you. Meanwhile know that we are all here anytime you need us...even just to lean on or ask for a hug...cause on this site, we are a family. Ellen, you sure have alot to contend with at the moment. But that will change. Instead of trying to go back to be someone you were historically, (which , by the way, is impossible to do) why not go forward as the new you. The new you is someone who has, in the past, smoked cigarettes for one, for two who has lovingly cared for and been with their precious pets when they passed. i think of the people who abandon an ill pet and it makes my blood boil. 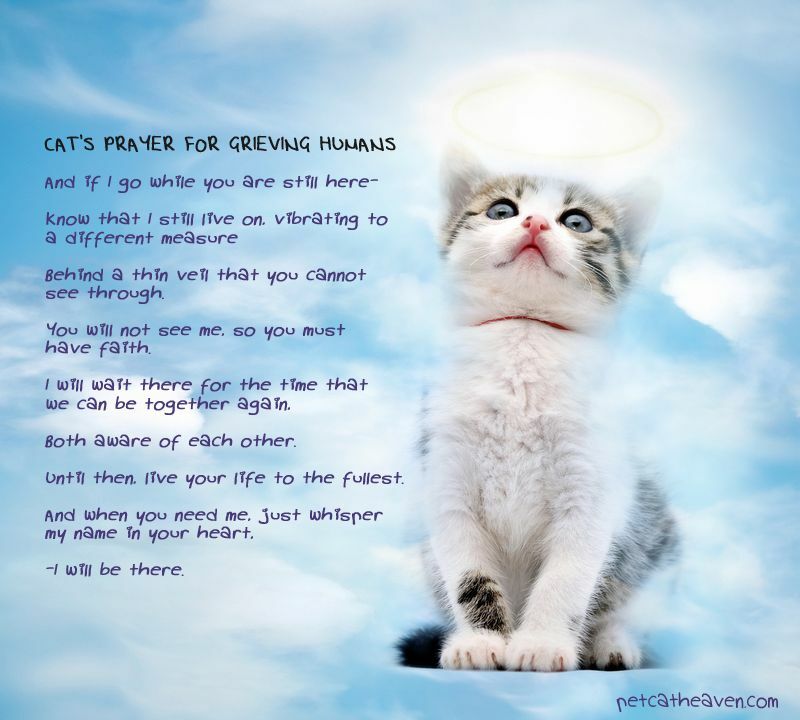 This did not happen for your pets, this does not mean that you do not grieve for them tremendously, you miss them. But would you bring them back to be ill, ? Certainly not. Go forward with the values that you have shown yourself to have and as the ethical person you have shown yourself to be and things will be alright. Bless you. dear Ellen, you did the best you could possibly do to help Bijou, and there is absolutely no reason to feel guilty or like you should have done more. Sending prayers and good wishes for the surgery and recovery to go well for Mike. I hope all goes smoothly, and you get some peace in your life. I hope you feel better soon. Don't feel guilty----you gave her a wonderful life. Our pets give us such love and loyalty------they deserve the tribute of our sorrow and sadness. I hear your loss and pain Ellen. So sorry about losing your kitty. Sending the "light" to you and your husband. Love you, My Dear Friend!!! Dear Ellen, grief yes, guilt no.....your vet is 100% right. You gave your kitty much more than anyone could possibly do, it was her time and that HURTS, I know that pain. So, yes grieve, but you have zero reason to feel any guilt, don't do that to yourself, your kitty was blessed to have you and you to have your kitty. Cherish the good memories. Personally, no matter how I lose a fur member of my family, I always have moments of guilt, second guessing, etc, I too do all I can, but I have come to believe that it's part of the grieving process, I think it's part of the denial because we don't want to ever part with them, so we say to ourselves, "hey, what else could I have done? ", the answer is nothing, nothing else; it was her time, there was nothing you could have done. You are an awesome, loving, caring person and Bijou was very lucky to find you. You are joined at the heart, and will be together again. Please know I am thinking of you and wish you comfort and peace, only time (as you know) eases the pain. Big hugs and lots of love sent to you! Ellen, so sorry you're still hurting so much. I know the feeling well. Bijou was lucky to have you and you were lucky to have her. That's what so wonderful about our pets. The unconditional love goes both ways. Nothing hurts our hearts more than seeing our little creatures hurt. I'm so sorry for your pain. Sometimes it can be hard trying to be strong all on our own, sometimes we may fail at it, but I do know how it feels to have to show others that I am strong even when I truly know that I am not! It's okay to lean on our friends, and I am trying to learn this! It's coming, but slowly! You have helped so many of us here Ellen, please let us help you comfort you! Let us be there for you, and if you simply can't, then please do know that you are in our hearts and in our prayers for comfort to heal your broken heart, and also that the surgery goes smooth, and for fast healing to go along with! Hang in there my friend! Nothing wrong with shedding some tears! I am so sorry you are brokenhearted over Bijou. Your love and dedication to her/him, showed. You gave Bijou your love and care when she was so sick. She isn't sick and suffering anymore. Guilt cannot be hung on you, you did the very best thing that you could have. I am praying hard for Mike and you today. I know how hard it is to take care of someone who can be a difficult patient. Sending Love and white healing light and prayers to guide the surgeon's hand. Words cannot express how much my heart aches for you and your beloved Bijou. I cried reading this knowing how very much you loved your little kitty to make all those accommodations to extend her life. She knew how very much you loved her and you did your very best that you could which is so much more than the ordinary person would do. Pretty please have no guilt, just compassion for yourself and your little Bijou. You both deserve that and so much more. I am so sorry to hear that Mark needs an additional surgery as well. He is in good hands and couldn't be any luckier than to have you by his side through out this. You are one tough, beautiful lady and I am are blessed for knowing you. You, Mark and Bijou are in my prayers. May your journey be a pleasant one filled with an abundance of kindness from the strangers you encounter. P.S. Glad that Damon is watching the cats and house for you. He is a good son. Ellen - Hoping all has gone well with your husband's surgery and that your spirit will heal a bit more each day. Sandi4 Mike's surgery is Monday...please keep the prayers coming. Dear elvan! May Bijou rest in peace! I relate to your feelings, we had to put our cat down... sheesh five years ago now and I cried for days. It was devastating!!! I would like you to know that we spent nearly $2000 at the vet and in the end we still had to put our sweet Sylvie down. I hope that helps you feel less guilt for not being able to cover the vet expenses. It seemed like it was more torture to run her through all those tests while she was struggling to breath and in retrospect I think it would have been kinder to let her rest. I know no words sooth the loss....feel sad if you need to. It's okay to be sad, it won't kill you. I think their little animal spirits take a little piece of us when they go. Anyway, as someone wise who I can't remember their name once said...the good news is nothing lasts forever, and the bad news is nothing lasts forever. Best of luck at the hospital! So sorry about you fur baby. I know it is hard. Thanks for posting. Wishing you and your husband strength and comfort during this difficult time. Thinking on you and Mike. Hoping it all went very well and the healing does too. Giulia Mike's surgery is tomorrow morning...I am not sure who is more nervous...no, that's not true, I am DEFINITELY more nervous than he is and I feel like I have a million things to get done. I planned to PLAN this but I had to work yesterday and it knocked me out, not sure why that always surprises me but I guess it is the degree that surprises me. Yesterday was horrendous and today is not far behind. We leave early in the morning. I will take my tablet and if we have wifi, will try to communicate that way, otherwise, I will text and update through Nancy or Missy. Prayers for you and your husband Ellen, you're such a inspiration! KMC56 Thank you for the sweet note...I am sure there will come a day when we can open our home to another rescue. Whether or not I can open my heart is questionable at this point in time but who knows? Oh, I thought it was the day after your wrote the blog. Well, you know we'll all be thinking of you two. Hugs. Giulia This entire thing has been a nightmare...I have been asking Mike to help get ready for the surgery, for himself AND for me...but he has proven to be more useless than I thought imaginable. He finds things to do to avoid doing what I ask and now, the night before the surgery, I find out that the hospitality house has no on site parking and that I have to park in a parking garage and take a shuttle to or from there. So much for taking my pillows and whatever I might need to be comfortable. It is going to be seriously hot so I really hope the place is well air conditioned. If it is NOT, I will rent a motel room...I cannot believe that they expect two handicapped seniors to travel via shuttle when one has just had surgery. I am not a happy camper tonight and I suspect that sleep is not going to come easily, if at all. Thanks for the hugs and the thoughts...I am so overwhelmed at the moment that I feel like just sobbing, for all the good that would do. Going to shower and put whatever I can into a small bag and try to get a little rest. Mike, obviously is not going to be helpful to you. From what you've said, it seems that that's a given. He is no doubt very afraid of this operation and it's consequences. I think we oftentimes forget that not everybody is like us. Strong and resilient, and thinking ahead and.. just - I think some spouses,they just CAN'T do that. They may act like "take charge" people, but in reality - they aren't that. I liken Mike's doing everything BUT getting ready for tomorrow, with the same psychology I have when I'm heading out of town. I know in advance I have to drive off to be a away for several days, and yet at the last minute, the day before, I will then spend most of my time doing the desk work I haven't done in a month. I do prepare for the trip in advance, but then my day before is suddenly trying to get my desk in order which I've had MONTHS to do. And it makes me frantic. Maybe I need to be frantic in order to get things done. I don't know. Maybe by NOT doing the things you want him to do in preparation is his way of pretending it's not going to happen. Or at least his way of dealing with it emotionally Because if he prepares, it's an acknowledgement of what's to come. And I get that. I sense you need a reminder of being grateful for what you DO have. All you're emphasis is on everything that's lacking. This is a difficult time, for sure. But try to find the gratefulness in it. It will let you breathe easier, I think, if you do. "She said," not at all setting an example of it herself. The fact that they offer inexpensive accommodations in itself is something to be grateful for. To my mind anyway. This will all be over and behind you in no time at all.